A Savonius is a type of vertical axis wind turbine (VAWT) generator invented in 1922 by Sigurd Johannes Savonius from Finland though similar wind turbine designs had been attempted in previous centuries. 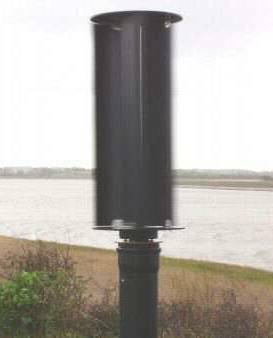 The Savonius is a drag-type VAWT which operates in the same way as a cup anemometer (pictured below). Looking at the anemometer, it has three cups mounted on a rotor which is free to spin. At any time the front of one of the cups will be facing into the wind, while the remaining two cups will be back on to the wind. As the backs of each cup are rounded, they experience much less drag than the front of the cup which is facing into the wind. Therefore the force exerted by the wind on the open cup will be greater than the total force exterted on the backs of the other cups and so the rotor will be pushed around (anti-clockwise in the example of the pictured anemometer). When the rotor has spun around one-third of a revolution, the cup which was open to the wind will now be back on, and one of the previously back on to the wind cups will have spun around on the rotor to offer its open face into the wind. In this way, the rotor will continue to spin for as long as the wind is blowing. With a Savonius wind turbine it does not matter from which direction the wind is blowing, since there will always be more force exerted on whichever cup has its open face into the wind, and this will push the rotor around. 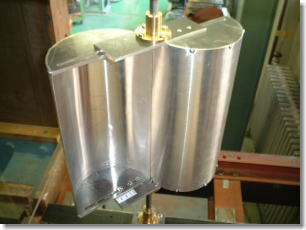 This makes this design of wind turbine ideal for areas with very turbulent wind. The speed of the cups of a cup anemometer (and a Savonius wind turbine) cannot rotate faster than the speed of the wind they are in and so they have a tip speed ratio (TSR) of 1 or below. 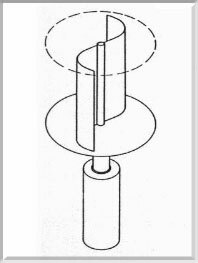 This means that a Savonius type vertical axis wind turbines will turn slowly but generate high torque. Therefore Savonius turbines are not ideal for electricity generation since turbine generators need to be turned at hundreds of RPM to generate high voltages and currents. A gearbox can be employed to reduce the torque and increase the RPM of the generator, but that leaves the Savonius requiring a stronger wind to get spinning meaning it may not be able to self-start. 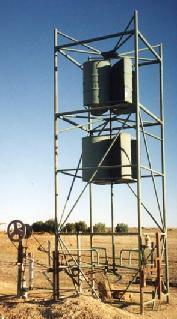 Savonius wind turbines are best suited to applications such as pumping water (see image above) and grinding grain for which slow rotation and high torque are desireable. They are often used in the Third World in exactly these ways with wind turbines made from an old oil barrel (or barrels) welded to a pole which is passed through bearings taken from an old vehicle. Because of the high torque yield of a Savonius wind turbine, the bearings used must be very sturdy and may require servicing every couple of years. Though not ideal, Savonius wind turbines can and are used in electricity generation – for example see our article on the Envirotek V20 VAWT generator – with the benefit that they continue to generate electricity in the strongest winds without being damaged, they are very quiet, and they are relatively easy to make. Standard HAWT (windmill) type wind turbines are unsuitable in locations with strong turbulent winds, so Savonius wind turbines can sometimes be the best option. They can also be mounted relatively safely at ground level as they spin much much slower than the speed of the tips of an HAWT. Savonius turbines do not scale well to kW sizes, but for a small project they are typically the easiest and cheapest wind turbine generators to build yourself. Click here to view our article Build a Savonius Wind Turbine to find out how to put together a small (<100W) Savonius wind turbine using cheap and easy to find items, and only a few tools. Alternatively, click here to view our free VAWT wind turbine plans to find out how to make Savonius wind turbine generators of other designs.